Get out on the water on this fun and functional short windsurf board. 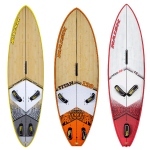 This used board is in great shape and versatile, it works well in all kinds of conditions from flat water to open ocean. Comes with Bic Sport bag.